Patulin is a naturally occurring mycotoxin that is produced by several species of fungi, such as Aspergillus, Penicillium and Byssochlamys. Typically growing on fruit, it has recently been implicated as a possible carcinogen and teratogen, although an official designation has not yet been made. The main risk arises when unsound fruit is used for the production of juices and other processed food products. The World Health Organization, U.S. Food and Drug Administration (FDA) and European Union (EU) have suggested a maximum limit of patulin in apple juice and apple juice ingredients at 50 μg/kg. Furthermore, the EU has set a limit of 25 μg/kg in solid apple products and 10 μg/kg in baby food (EC 1881/2006). 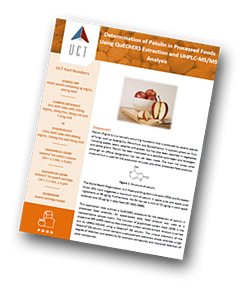 An apple-based baby food product was used as a representative sample matrix. The inclusion of graphitized carbon black (GCB) in the dispersive-SPE (dSPE) cleanup step produces a clean sample extract. Analysis is carried out by UHPLC-MS/MS using a Selectra® DA column. The unique chemistry of the Selectra® DA column, which contains a polyaromatic stationary phase, provides a high degree of retention and selectivity for aromatic compounds and improved retention of polar compounds. Details of the QuEChERS procedure are provided within the application note and covers sample extraction and sample clean-up. LC-MS/MS parameters are given and results showing recovery and reproducibility are provided in a table.